If Pinterest activity is any sort of barometer of what people are interested in, I think it’s safe to say that plenty of people love fall decor. The season of football games, bonfires, and caramel apples makes us feel warm and cozy as we prepare to nest indoors during the cooler months. 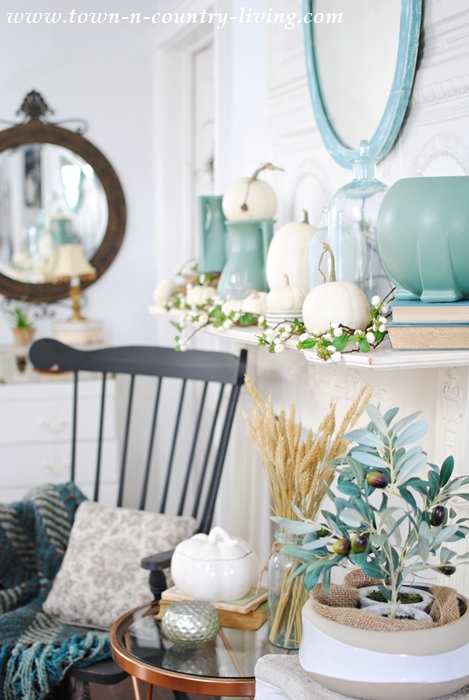 As I thought about how I’d adorn my mantel for autumn, I decided to create a non-traditional fall mantel using natural items in a white and blue-green color scheme. 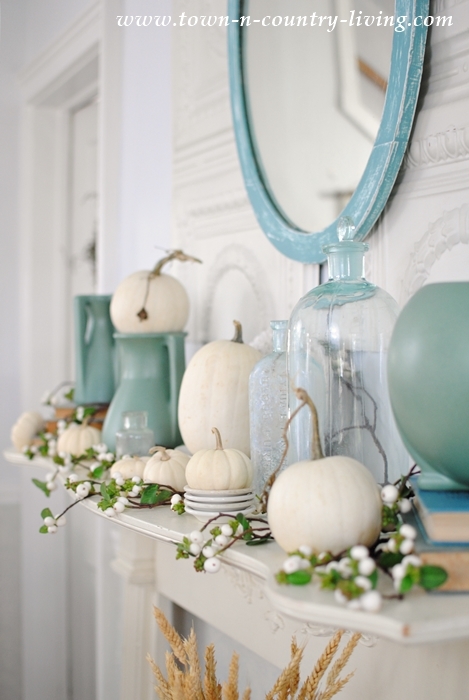 My mantel is non-traditional in the fact that it doesn’t consist of your typical fall colors like orange, brown, red, or yellow. 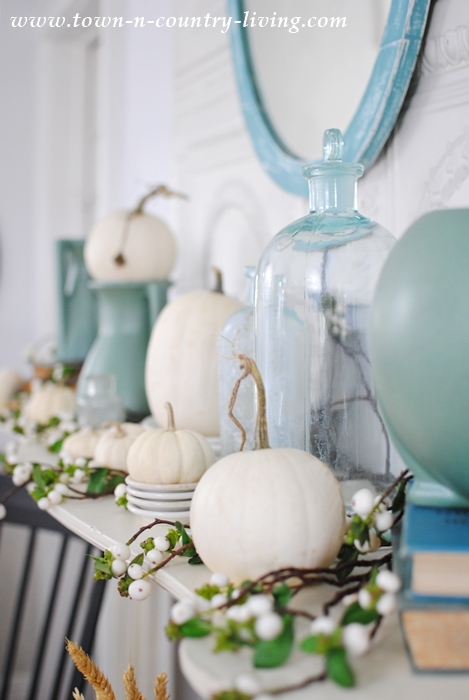 But in order to be considered a fall mantel, I included your basic white pumpkins and baby boos. 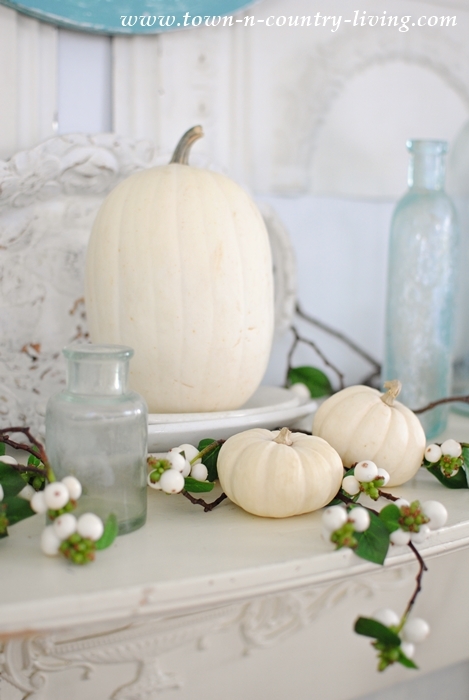 I also added beautiful white berries, which I can use at Christmas too! 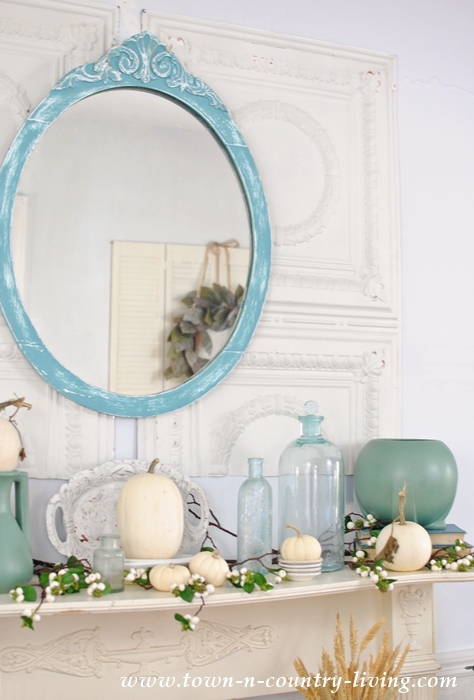 So how do you create a non-traditional fall mantel? 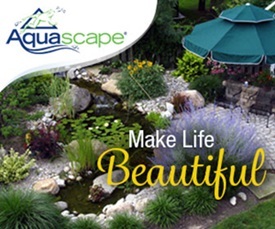 Start with an inspiration piece that isn’t necessarily fall-related. For me, that was my new Teco Art Pottery that I shared several blog posts ago. 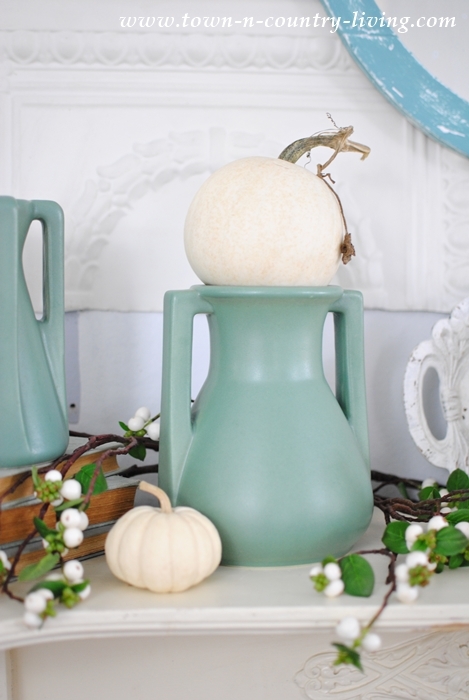 I love the blue-green hue and shape of the vases. And I knew how perfect they’d look with white pumpkins. 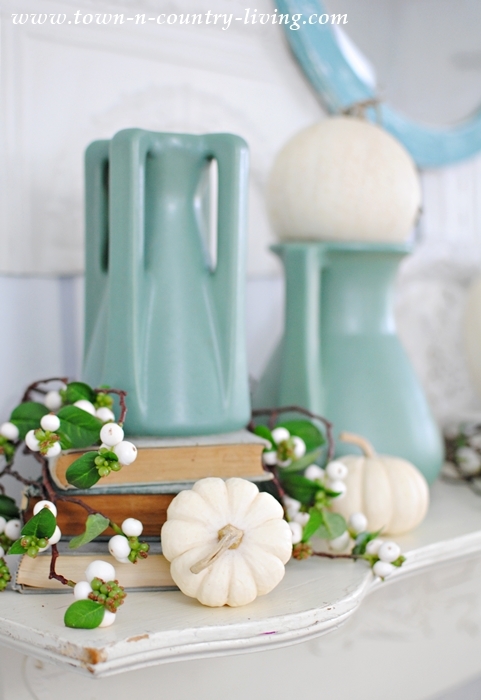 Add white berries and a few vintage books to add height to the vases, and you’ve got a non-traditional fall mantel. I added a few of my vintage bottles to the mix, for fun and interest. And a few white ironstone butter pats to elevate a single Baby Boo. 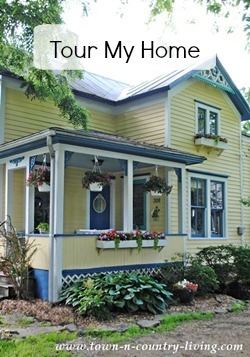 For those of you who love the Teco Art Pottery as much as I do … I have some good news for you! PrairieMod is offering a 15% discount off any Teco Art vase to Town and Country Living readers now through October 7th!! Simply enter promo code TANDC15 at checkout. 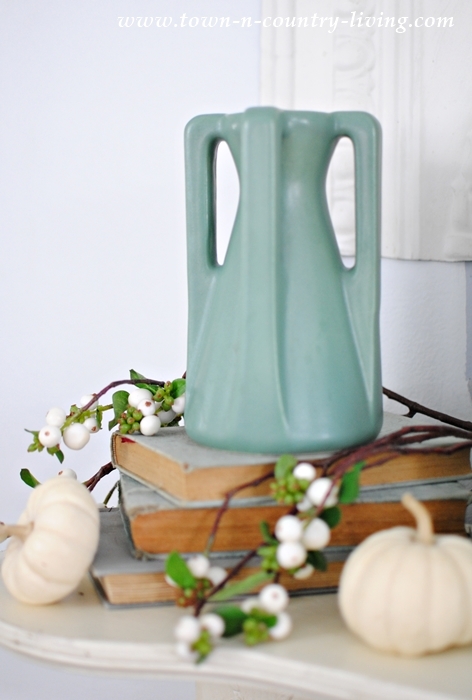 When I introduced Teco Art Pottery on my blog, many of you fell in love with the Orb vase. The vases are available in a variety of colors; green, aqua, royal blue, orange, red, brown, and white. 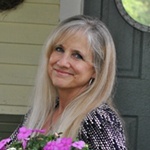 You can view them at PrairieMod’s website. Remember to enter promo code TANDC15 at checkout to receive your 15% discount. 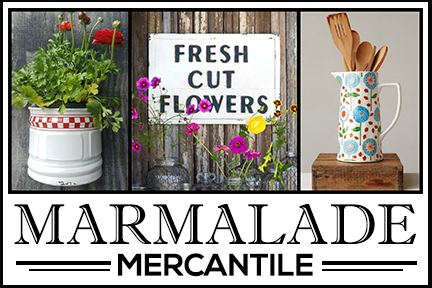 PrairieMod is a local business and I love supporting them … especially when they carry such beautiful artisan pieces. Beautiful color combination and textures for fall. 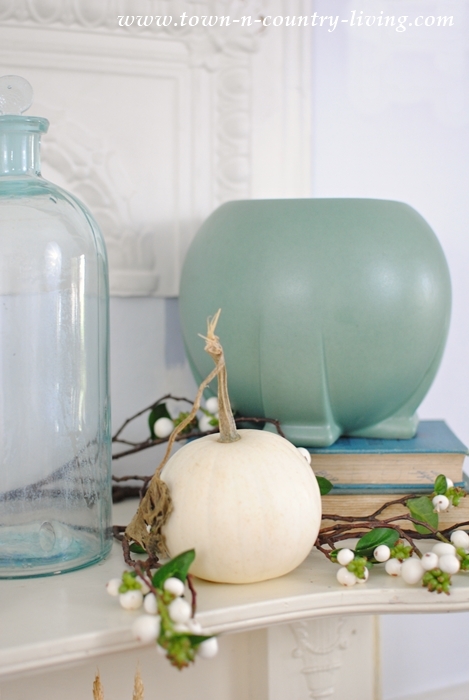 Always love how you incorporate your pretty vintage bottles into your decor. I think you created a wonderful fall mantle. I like the combination of colors. I don’t do the traditional colors of fall either, doesn’t work with our décor. Your mantel is gorgeous, Jennfer! 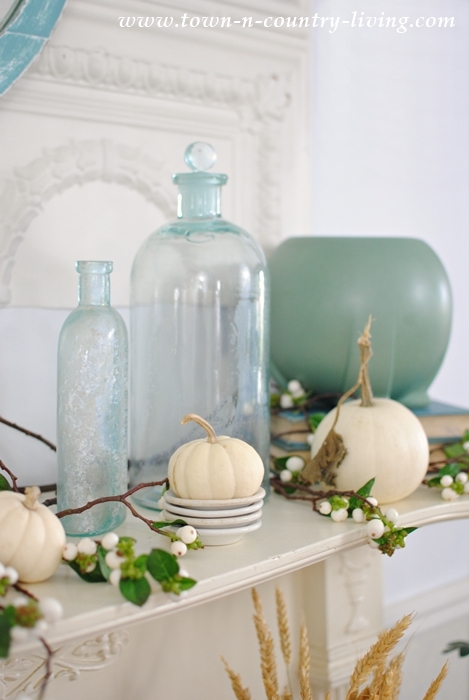 Nice to see some different ideas for fall decorating. 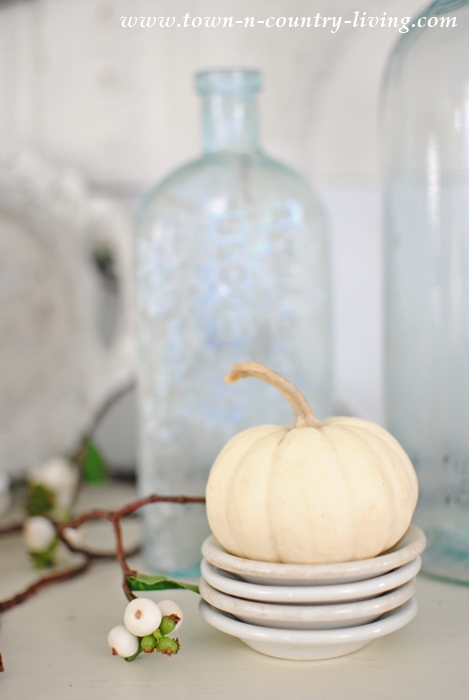 Since my living room is yellow, fall decorating is easy…..Christmas is another story. It took me a while to pull it together, but I love my yellow living room at Christmas now. Thanks for your continued inspiration! Love it. Love the Blue! I’d love for you to share at the party. Come over and link up any day! Happy Fall! Lovely and simple just what i like and your colors are my favorite. Have a great day. Oh wow. I am in love.